Finishing Techniques: additional photographic tutorial to consolidate notes given at workshop. Intarsia is a colourwork technique which involves knitting blocks of colour, without carrying yarn at the back of the work: only one strand of yarn in one colour is used at a time. As a consequence, a separate ball of yarn (or some yarn wound onto a little bobbin) is needed for each block of colour. The key to a neat piece of knitting in intarsia is to avoid holes where the colour changes occur. In order to achieve this, the two colours need to be “twisted” so the yarn for the new colour “traps” the old one. When the changes of colour are stacked upon each other row by row, thus forming vertical lines, proceed as follow: knit with the “old” colour up to the change, hold this strand in front of the “new” colour (but still at the back of the work), catch the new colour and knit the first stitch of the new colour area, thus trapping the old colour between the new colour and the knitted fabric at the back of the work (see picture on the right). After completing a few rows, the knitting should look like the picture on the left when viewed from the wrong side. When the colour changes are not stacked perfectly, but “slant” to one side, the technique remains the same. Knit the stitches in one colour as per the pattern; when reaching the point where a change of colour is required, catch the new colour from below the old colour and knit the new stitch while trapping the old colour. This will create a diagonal “strand” of the old yarn at the back. This section has moved to its own page. 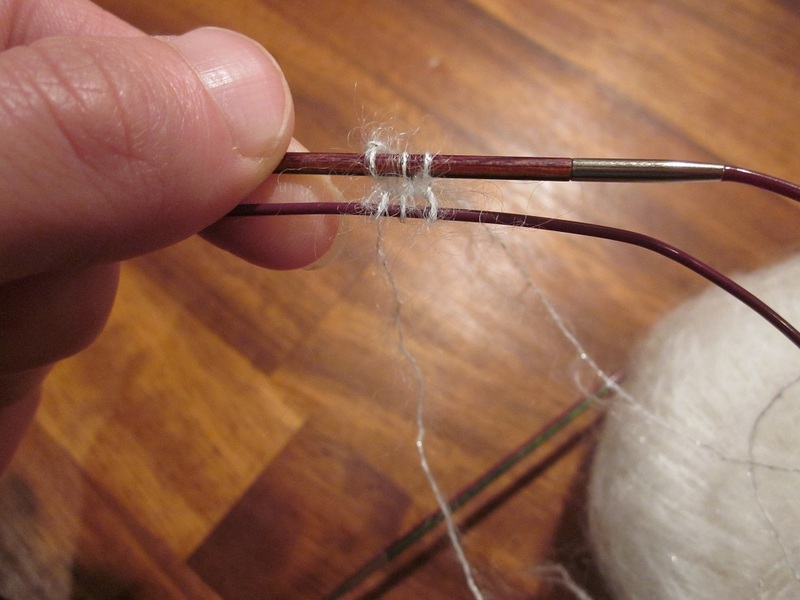 Turkish Cast-On is a technique that enables to start knitting in the round with no hole, gap, or twisted stitches, and starts by simply wrapping yarn around two tips of needle. 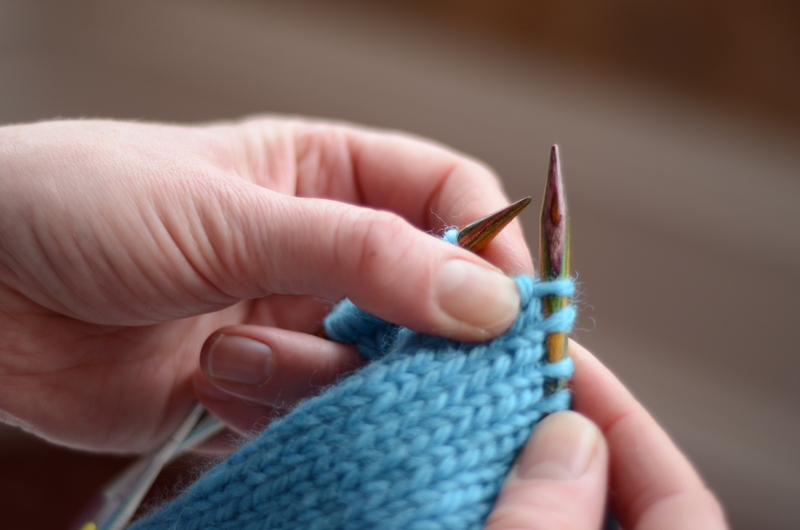 With your left hand, hold one tip of each of the two circular needles parallel to each other and pointing to the right. Hold* the tail of the yarn (leaving approx. 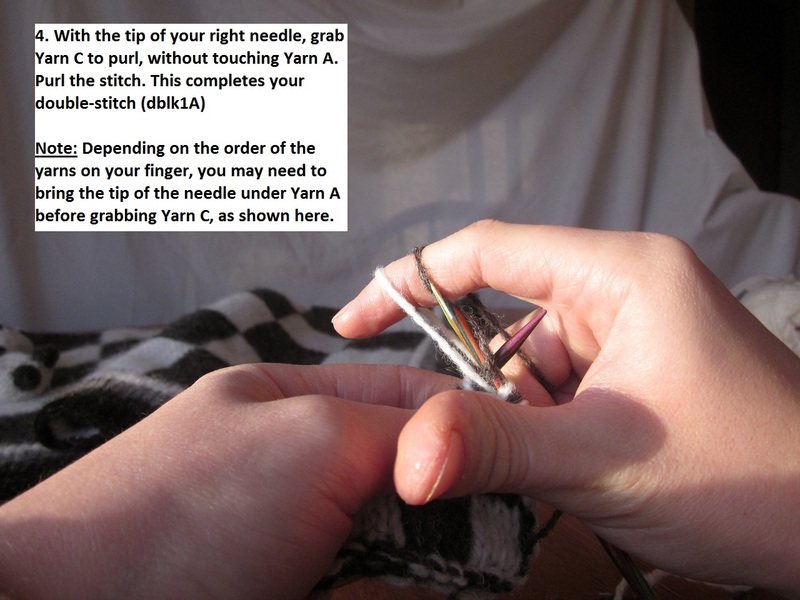 15-20 cm (6-8 in)) between your left thumb and the needle at the front. 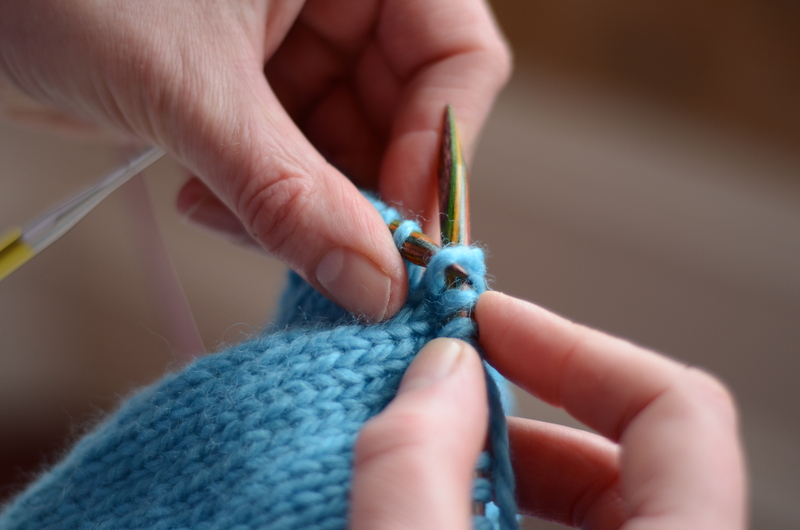 With your right hand, wrap the working yarn three times around both tips from under the needles, away from you and back towards you over the needle tips (Photo 1). Pull the front needle tip so the wraps are now sitting on the cable, and knit with the needle at the back through the first 3 loops to create the first stitches (Photo 2: first stitch being worked; Photo 3: all 3 stitches worked, end of work on back needle). Dimple Stitch produces an exaggerated texture which when knitted in a chunky yarn looks a bit like puffy sheep fleece. gathering stitch – take yarn to back of work as though to knit, insert needle from below under 3 strands, knit the next st, bring the st out under the strands. Wrong Side of Fabric. Immediately below the needle you can see the 3 rows of ‘stranding’ which occur once rows 2, 3 & 4 or rows 10, 11 & 12 of the 16 row repeat have been worked. Shows the right hand needle ‘under 3 strands’ and now beginning to ‘knit the next stitch’. Shows the stitch being brought out under the 3 strands. 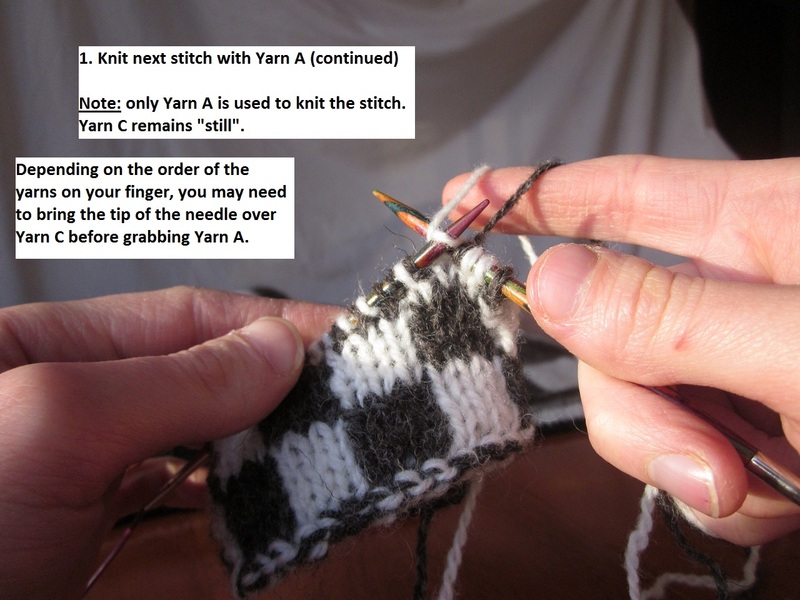 It may be helpful here to use the thumb of your left hand to guide the strands over the stitch. Row 2 – P1, * sl 3 wyif, P3; rep from * to last 4sts, sl 3 wyif, P1. Row 3 – K1, * sl 3 wyib, K3; rep from * to last 4sts, sl 3 wyif, K1. Repeat these 16 rows to form pattern. 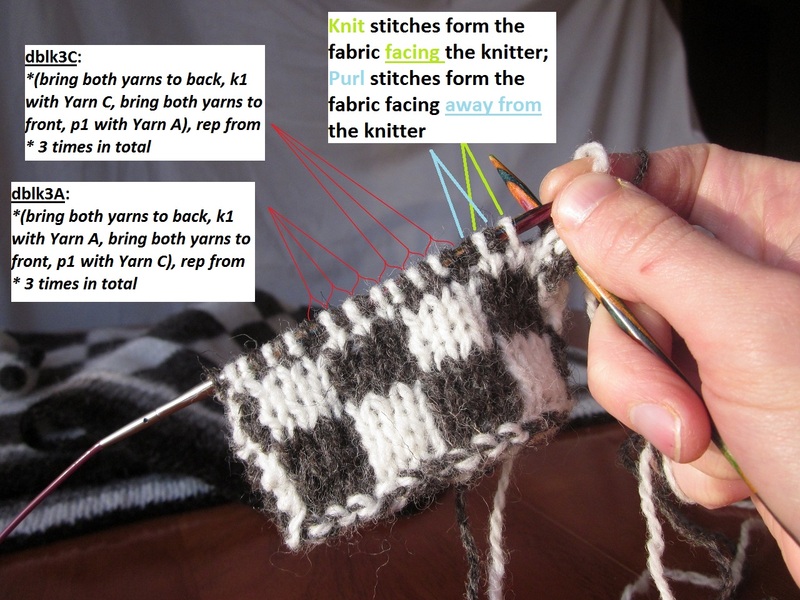 Reversible Double Knitting is a technique which consists in creating a two-layer double-sided and reversible piece of knitting, in one go. Using two colours, the finished item shows the same pattern (reversed) on both sides of the work. Not only reversible Double Knitting produces a piece of knitting that is neat on both sides, with no “right” and “wrong” side, but it also creates a perfectly flat and balanced piece of work which does not curl back on itself, making it perfect for scarves or blankets. 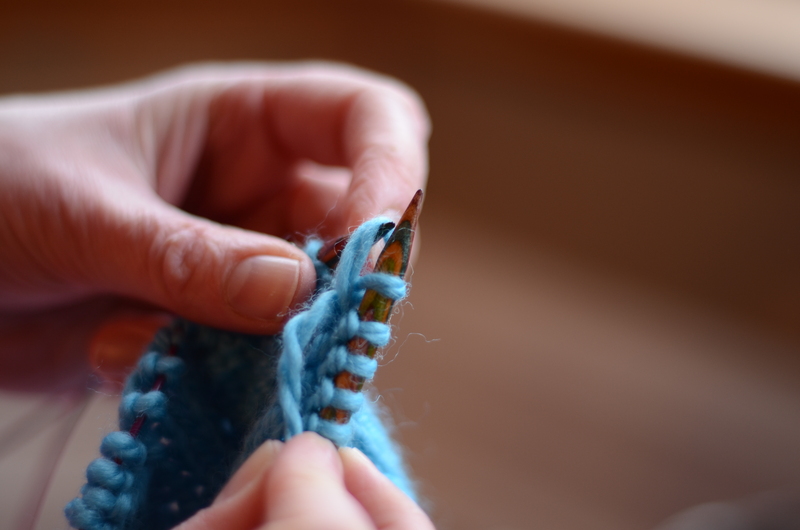 In substance, for every stitch in the design, two stitches are actually worked: one knit stitch for the side facing the knitter, using one colour, and one purl stitch for the side facing away from the knitter, using the other colour. Consequently, giving the instruction for one side only is necessary and sufficient to work the whole piece of double knitting. In a piece of work where Yarn A and Yarn B are used: the instruction “dblk5A” for instance (un-vented for the “Sheepy Draughts and a Wolf Too” design, by Aurelie Colas), will indicate that the next 5 double-stitches are to be worked so that Yarn A is used for the knit stitches, which translates as: *(take both yarns to the back; with Yarn A, knit 1; bring both yarns to the front; with Yarn B, purl 1), rep 5 times in total. The wrapping method used in the heel turn of this sock workshop is unusual. For those who have never wrapped stitches before it requires less steps to execute and is therefore slightly less ‘tricky’. It was invented by Jeny Staiman, who is also the author of ‘Jeny’s suprisingly stretchy bind off‘, my favourite cast off method for Toe Up socks. You can check out Jeny’s blog here and catch up with her on Ravelry here. The following is a photographic tutorial to guide workshop participants through the ‘Turning the Heel’ section of their notes. Image 2: Round 1, needle 2 – Working the first ryo. Note the yarn is coming from back, will proceed around the needle and finish again at the back of work. Image 3: Round 1, needle 2 – The left hand needle is now passing the ryo (or yo) over the stitch just slipped in order to wrap it. Image 4: The ryo (or yo) has been passed over and the slipped stitch is now wrapped. Note horizontal bar at base of first stitch on right hand needle. Image 5: Round 1, needle 1 – The second marker has now been placed on left hand needle. Image 6: Round 1, needle 2 – The work has been turned to wrong side. You will now work back and forth on needle 2 only. You are ready to start Row 2. Image 7: Row 2 – Working the yrn. Note the yarn comes from the front, around the needle and back to the front again. Image 8: Row 2 – The yarn is at front after yrn and the next stitch is slipped purl wise. Image 9: Row 2 – The left hand needle is lifting the yrn (or yo) over the stitch just slipped in order to wrap it. Image 10: Row 2 – The stitch is now wrapped. Note the horizontal bar at the base of the first stitch on right hand needle. Part One of the workshop covers sewing up. The first gallery shows a mattress stitch seam worked on K1, P1 rib. Click on individual pictures to enlarge and scroll through the images. 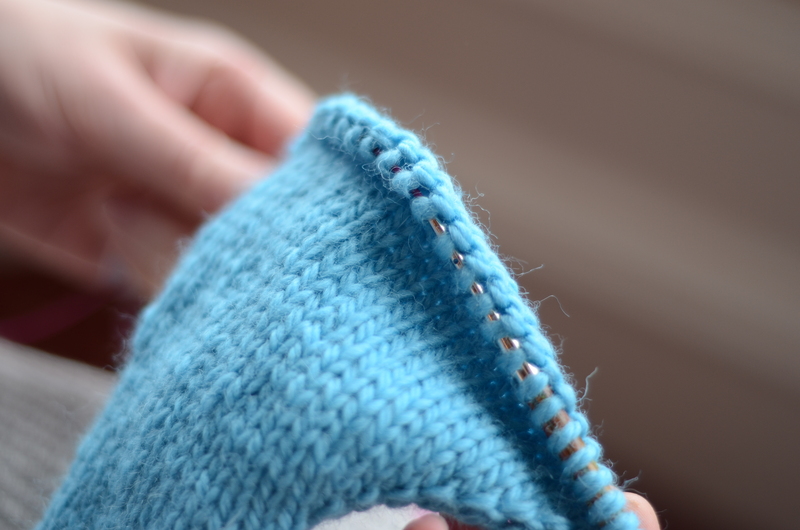 If both pieces end with a knit stitch, pick up ‘bars’ a half stitch from edge. Pick up ‘2 bars’ at a time, side to side. continue up the seam, working from left edge….then right edge……. …. 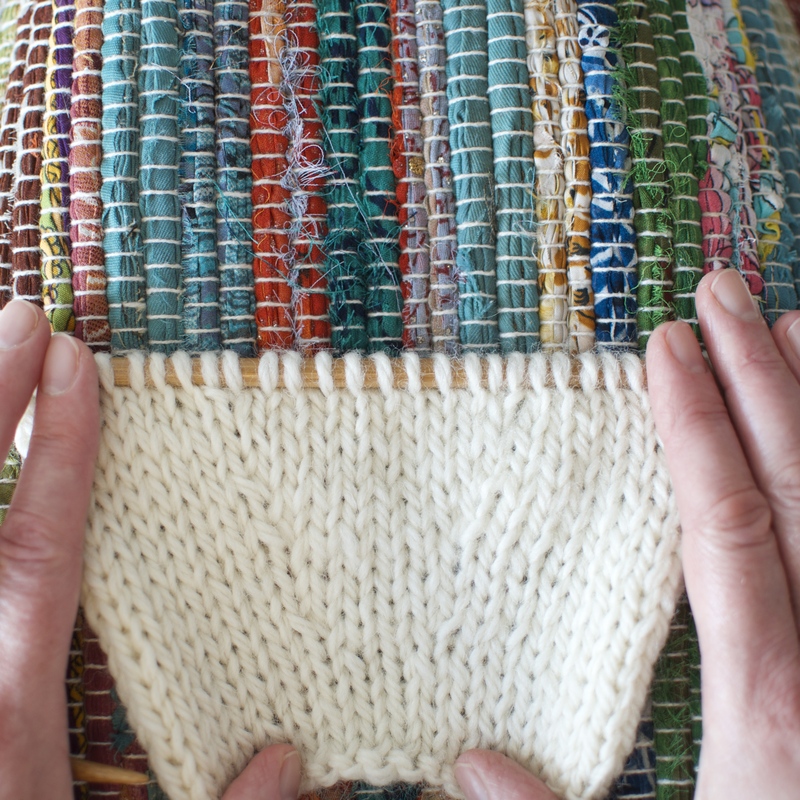 a few stitches at a time…..
Gallery No 2, shows a mattress stitch seam joining two pieces of stocking stitch. Gallery No 3, shows a mattress stitch seam joining two pieces of garter stitch. A smile from the right, just in from the edge. an ‘eyebrow’ from the left, right on the edge….. The completed seam shows the ‘eyebrows’ overlapping the ‘smiles’ making the seam almost invisible. Gallery No 4, shows a mattress stitch seam joining two panels of moss stitch. Like stocking stitch work one stitch in from the edge. The ‘2 bar’ rule applies. Gallery No 5 shows a mattress stitch seam joining 2 stocking stitch panels which are set at right angles to each other. As if setting in a straight sleeve. Two panels set at right angles ready for joining with matress stitch seam. The needle works from side to side in the same way as other mattress stitch seams. With pieces set as shown pick up ‘2 bars’ from left piece, one stitch in from edge. Next pick up from right piece, inserting needle in the centre of first stitch (or ‘V’) and out of the centre (or ‘V’) of the second stitch. Gallery No 6 shows grafting of two panels of stocking stitch. As if joining a straight shoulder seam. 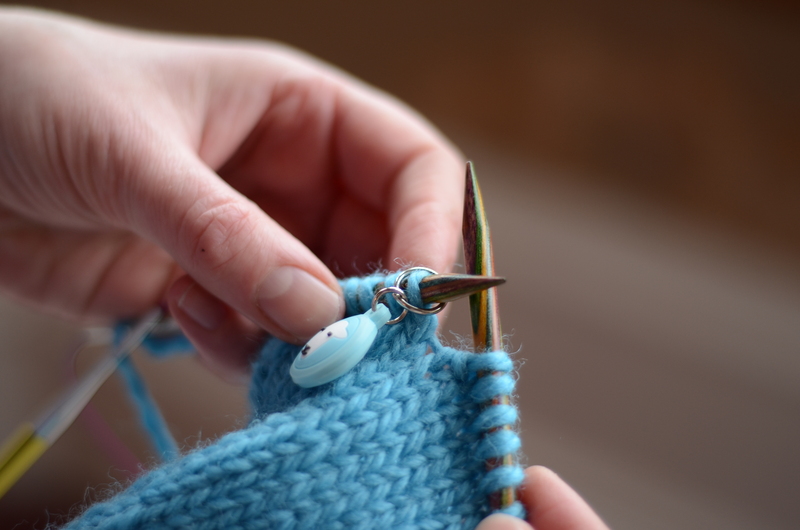 Begin by inserting the needle around the first complete stitch of left piece. Next insert the needle in the centre (‘V’) of first stitch and out of the centre of the second stitch (‘V’) of right hand piece. Continue along the seam in this way to invisibly graft the two panels together. 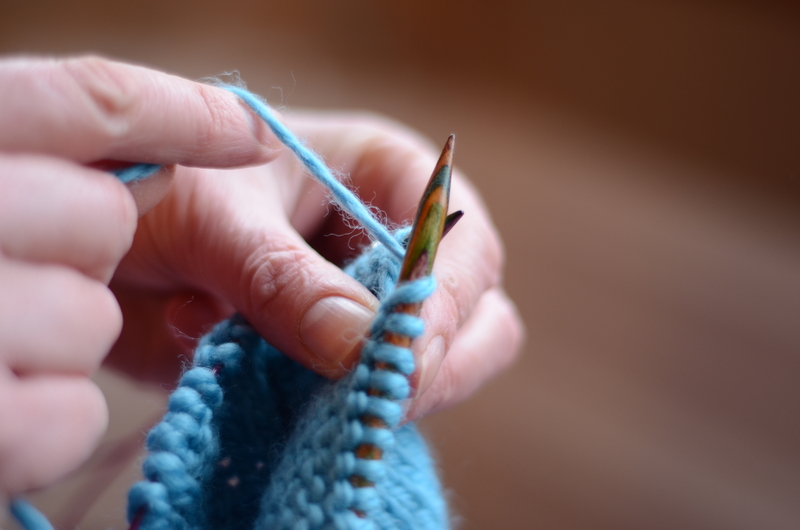 Keep the stitches a close in size to the original knitting as possible. 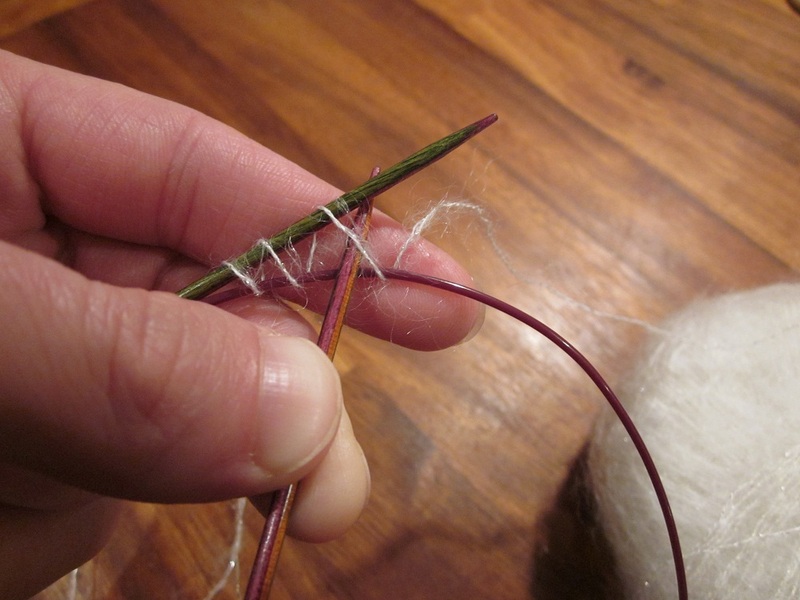 …….but pull up the stitches tightly to form a visible seam. 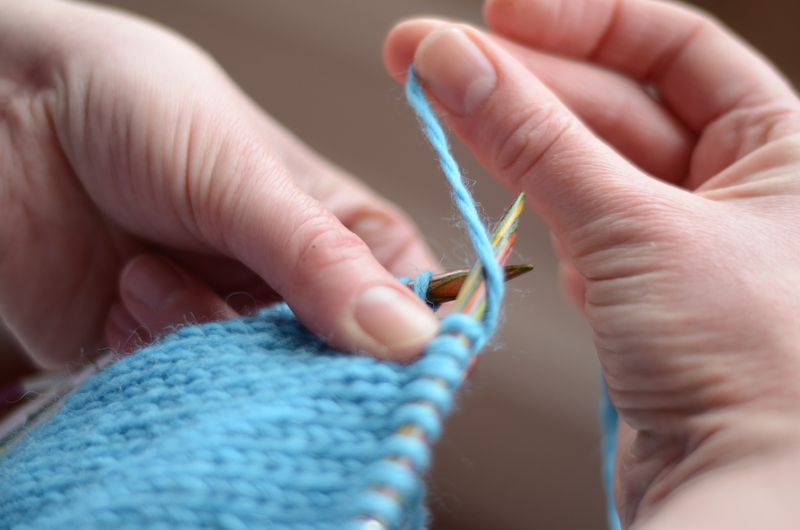 Gallery No 7 shows how to join a band of garter stitch to a panel of stocking stitch. Work side to side in the same way as other mattress stitch seams. Working one stitch in from edge of right panel, take the number of bars required. Now take one ‘eyebrow’ from edge of the left panel. 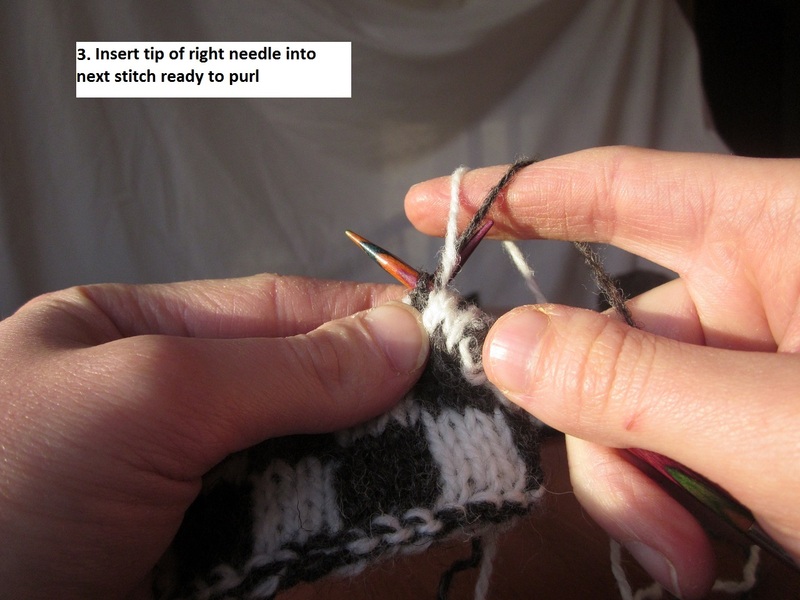 Insert right needle into next stitch as if to knit. 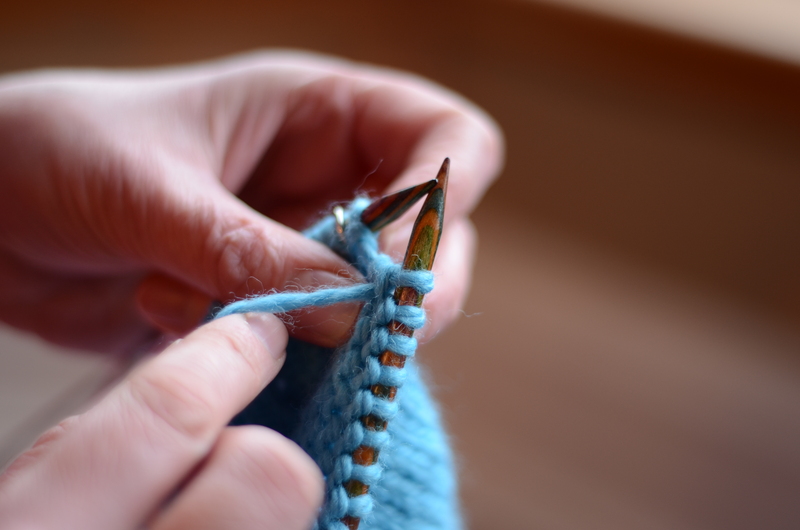 Wrap working yarn twice around the tip of the right needle, and resume knitting as normal. The extra wrap created must be dropped as the slipped stitches are worked in the following round. 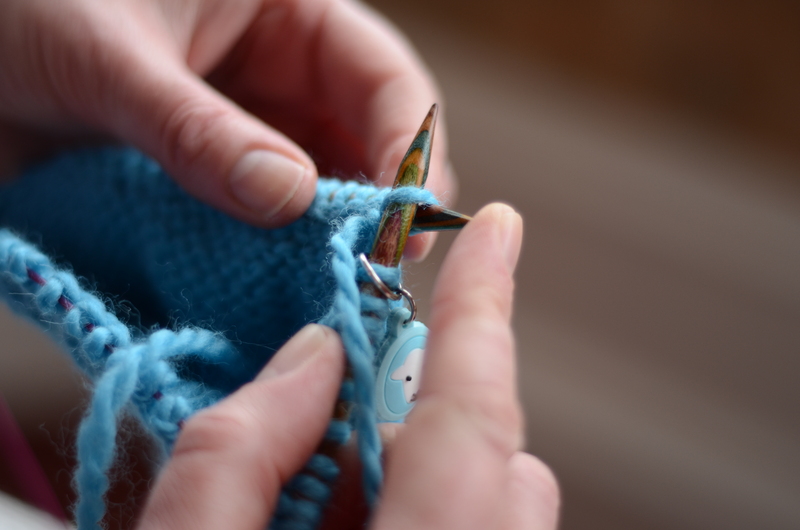 This cast on allows one to begin knitting in the centre and knit outwards, circularly. 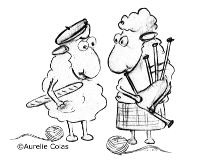 It is perfect for circular shawls and blankets, top down hats and for a Wee Blackface Sheep bottom! 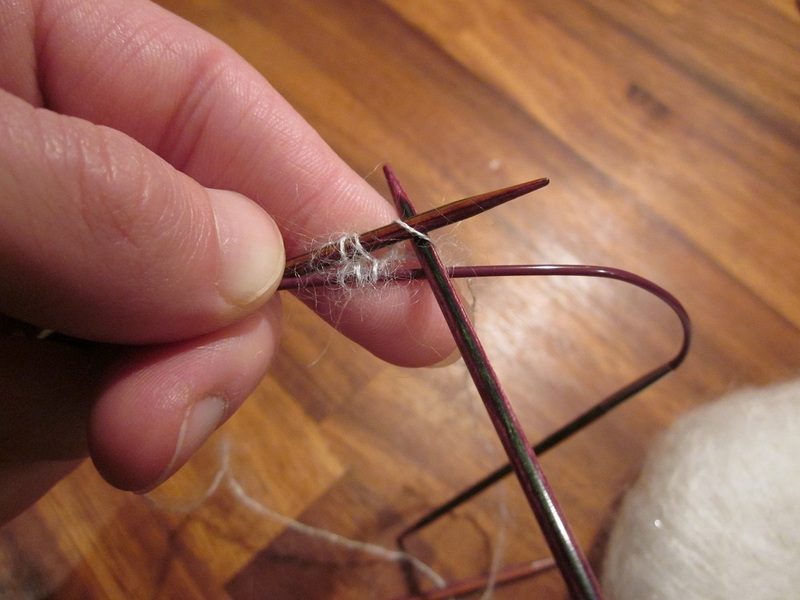 Step 2:Grip the knot of the loop and the needle in your right hand. 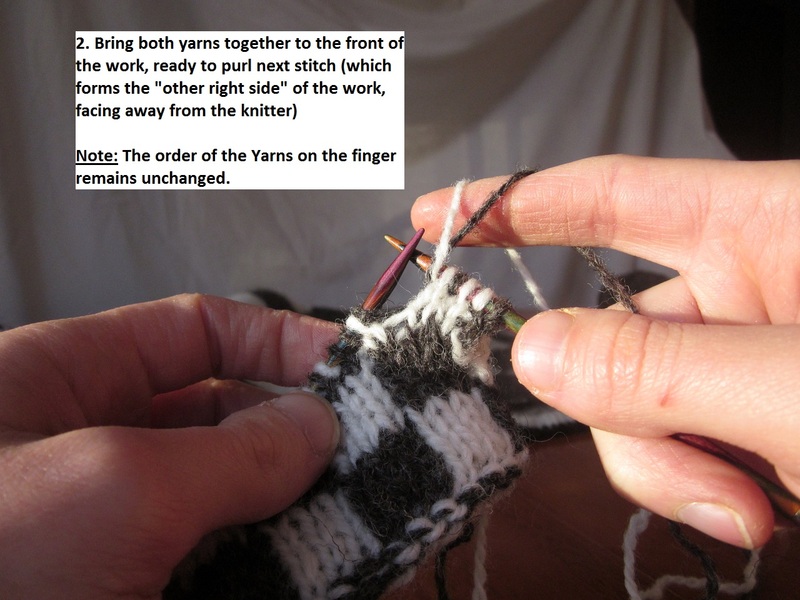 The working yarn lies over index finger and loop is held open using ring finger of left hand. Step 3: Insert needle into the loop. 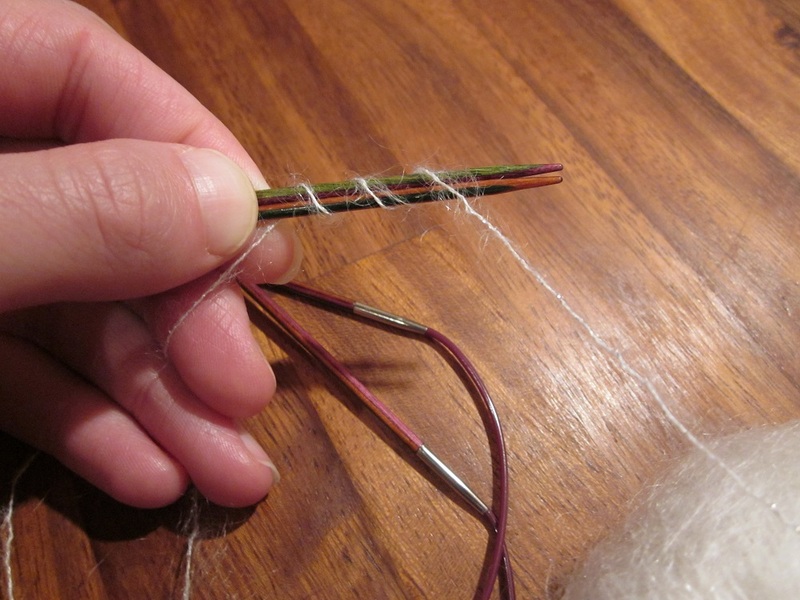 Step 5: And pull the working yarn through the loop. Step 6: One stitch created. 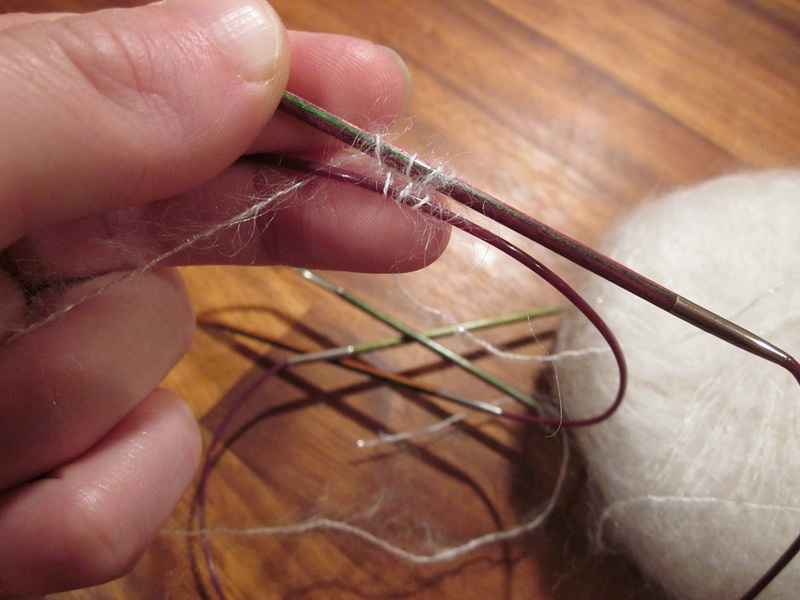 Step 7: Now take needle tip under the working yarn, as if to make a yarn over. Step 8: This becomes the second stitch. Step 10: Until you have the required number of stitches. Step 11: Pull up the tail to gather the stitches together. Step 12: Pull working yarn across the back of sts (as if to work an i-cord and knit across the stitches. 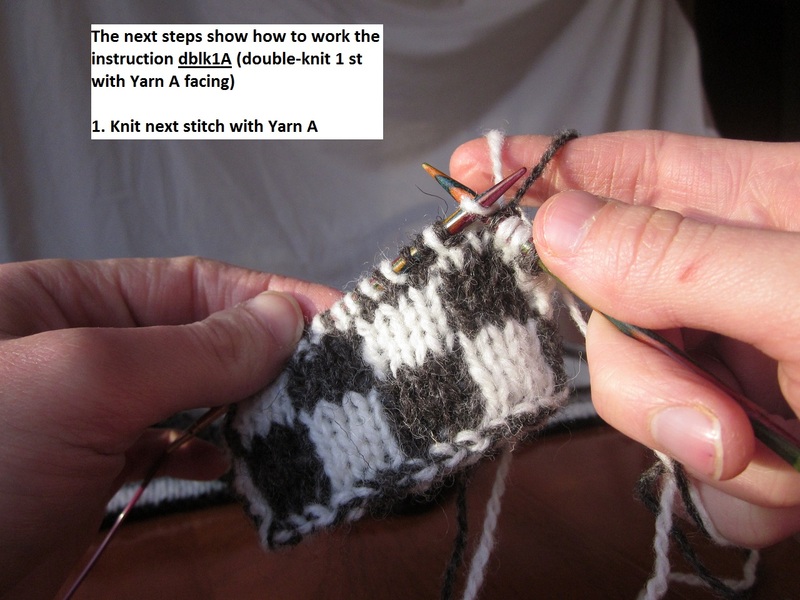 Step 13: Divide stitches equally between dpns (or circulars)….and begin working in rounds. Step 1: Begin with K1. Thumb indicates the stitch 2 rows below the stitch just worked. Step 2: Insert right needle into the left leg of this stitch. Step 4: …And knit it. Step 5: Worked correctly the finished increase looks like this. Step 2: Insert the right needle into the right leg of this stitch. 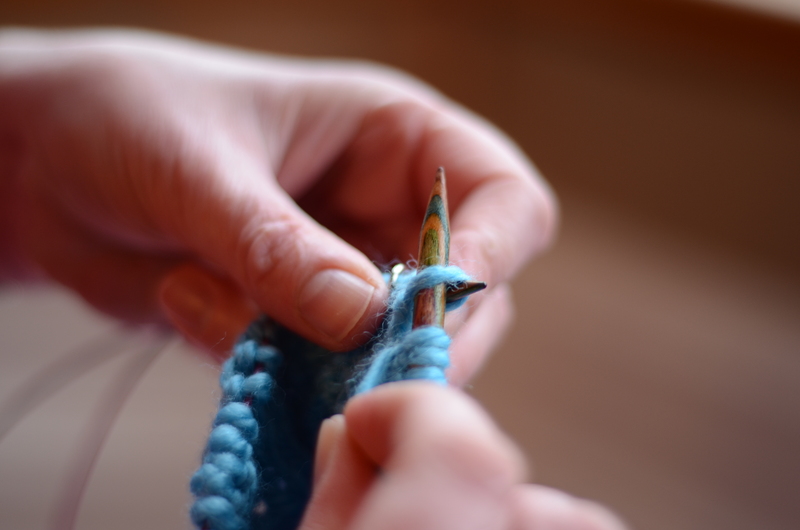 Step 4: ….And knit it. Step 5: Knit next stitch. Step 6: The finished increase should look like this. This neat form of left leaning decrease is prettier than the more traditional left leaning skp (slip 1, knit 1, pass slipped stitch over) and pairs particularly well with the right leaning K2tog. This double decrease neatly hides the decrease stitches at either side of one raised central stitch, producing a very neat finish. Worked on the purl side, this neat form of decrease produces a left lean on the knit side and pairs particularly well with the right leaning P2tog. Hello Cath, Please accept my apologies for the delay in replying to your query. I am afraid I only found your message when ‘tidying’ my inbox. It is sometime since I knit the Herdy Bottle Cover. My memory is failing me! Without casting on, my instinct tells me I would work to last 2 sts, M1, then work last 2 sts together as pattern. What have you tried? And what goes wrong?